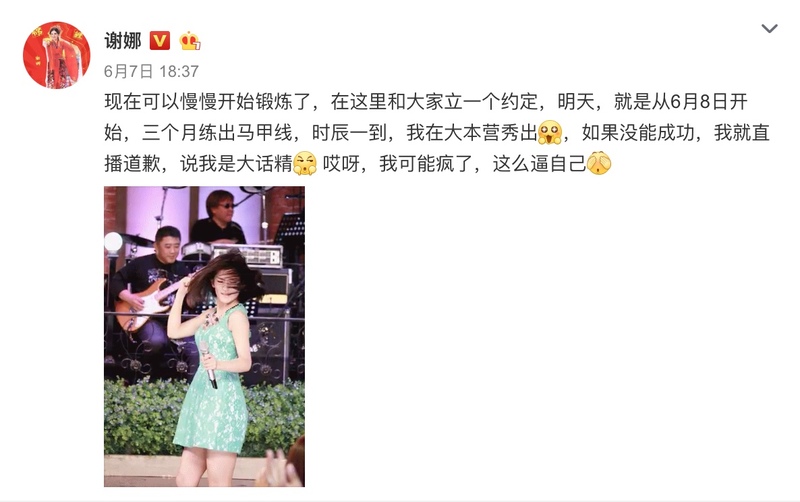 About 3 months ago, Xie Na made a promise through her Weibo to start training in hopes of getting some ab definition. This is after she gave birth this January to twins and her announcement was a personal challenge to lose the baby weight. She updated with a photo of herself this month of her progress. She said that she was about 150 pounds when she carried twins and thought that there was no hope for her abs. She says it's still not very defined, but she will work hard. I was curious to find the average time to achieve this and so I learned it can take anywhere from 3 to 20 months to achieve a 6 pack depending on the amount of body fat you have. So I am guessing it wouldn't take her much longer to get the 6 pack since I don't see a lot of fat on her body left, not like myself. Haha! Congratulations Xie Na! Your hard work paid off!